On October 19, a few days after Jamyang Norbu went online at “Shadow Tibet” with an essay entitled “Igniting the Embers of Rangzen,” I posted some remarks in the comments section for that piece, simultaneously putting them up in the “Getting Your Bearings” section of the “Chalk Tibet” site as well. As I assumed was clear to readers, I was motivated to comment by references in English-language accounts of Nor-bu dgra-’dul’s act of self-immolation to his call, just before dying, for Tibet’s “complete independence.” That phrase has a history of disingenuous use in political discussions in exile, so I was curious about what Nor-bu dgra-’dul had said in Tibetan. Two days later the International Campaign for Tibet, taking umbrage at my comments, posted a reply at TPR. I followed with a rejoinder on October 27. Several friends have asked that I post the different parts of this exchange in one place for easy reading and I’m happy to oblige. Thus, here, in order of appearance, are my original remarks, ICT’s response, and my rejoinder. For this reason it is particularly important that we know as much as we can of what the Tibetans who are sacrificing themselves are saying in Tibetan. What does it mean to read in English that Nor-bu dgra-’dul called out for “complete independence?” The term “complete independence” was generally wielded in Dharamsala throughout the 1990s to mitigate the real significance of the stance that the Tibetan-Government-in-Exile (before it joined the Dodo in blissful extinction) was taking. The tactic was to insist to the general population that the TGIE was simply not for full independence rather than honestly asserting that the TGIE rejected Tibetan independence and accepted that Tibetans are just a minority nationality of China. By ostensibly not being for “full independence” the broad exile population could lull itself with the sense that the TGIE was still supportive of Tibetan independence of some sort, just not independence of the “full” sort. Misleading? Yes, but then again, that was the point, wasn’t it? So we come to Nor-bu dgra-’dul’s last words as described in English: a call for “complete independence.” Now, one needs to bear in mind that the term “complete independence” (what Dharamsala opposed and opposes) has been used as a rhetorical tool to mark extremists. This, even though demonstrations in Dharamsala and elsewhere in the Tibetan world were in part characterized for decades by the broad mass of participants proclaiming “Bod rang-btsan gtsang-ma yin!” This phrase is essentially an assertion of Tibet’s legitimate identity as a country replete with all the attributes of independence. It differs somewhat from exclaiming “Bod rang-btsan gtsang-ma dgos,” which asserts that Tibet needs to be cleanly or fully independent. One might argue over why such assertions have been demonized in Dharamsala (though the reasons seem quite obvious). But for our purposes the fact that this language has become controversial requires that we ask, specifically, what Nor-bu dgra-’dul cried out before he died. I have been asked to respond to your article “Extinguishing Rangzen.” I would like to direct you to the ICT report published on October 16 (“Self-immolations continue in Tibet; 8th young Tibetan man sets fire to himself in Ngaba”), in which Norbu Damdrul is quoted as shouting “We need freedom and independence for Tibet” during his protest (see first paragraph, second sentence). In regards to the validity of your assertion that ICT is involved in a conspiracy to purposefully mistranslate calls for independence, I believe your omission of what was stated in ICT’s report on Norbu Damdrul speaks for itself. ICT stands by the integrity of its reporting, and we appreciate the opportunity to set the record straight. I made no further mention of ICT in my commentary, but I understand ICT’s consternation at any allusion to its role in creating the ongoing atmosphere of misunderstanding and/or deceptive reporting about statements made in Tibet. If ICT itself is no longer doing this, then bravo! But the damage has been done and the errors continue under the bylines of others. Since ICT now seems to believe that a Tibetan calling for rang-btsan should not have his or her words distorted, and since ICT is concerned about setting the record straight, I’m happy to provide materials for the task. 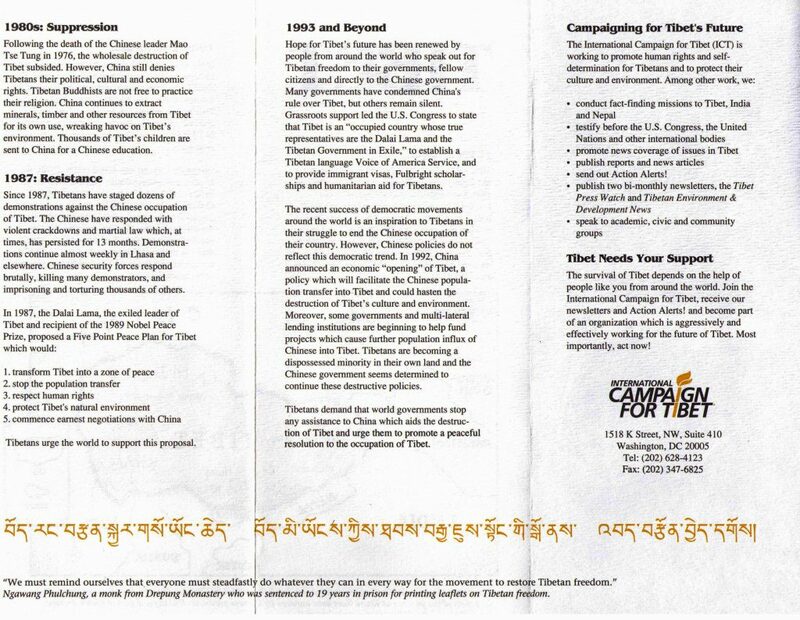 Here’s an ICT flyer from the mid-1990s purporting to present Tibetan sentiments to both supporters and potential donors (I omit the flap with the donation options). The significant portion is what is at the bottom. And what is interesting about this is that it’s one of the few (I believe) ICT documents with a direct quote from a Tibetan political prisoner in Tibetan, followed by an English translation. Specifically, it’s part of an appeal from Ngag-dbang phul-byung, a member of that group of political prisoners then known as the ’Bras-spungs 10. 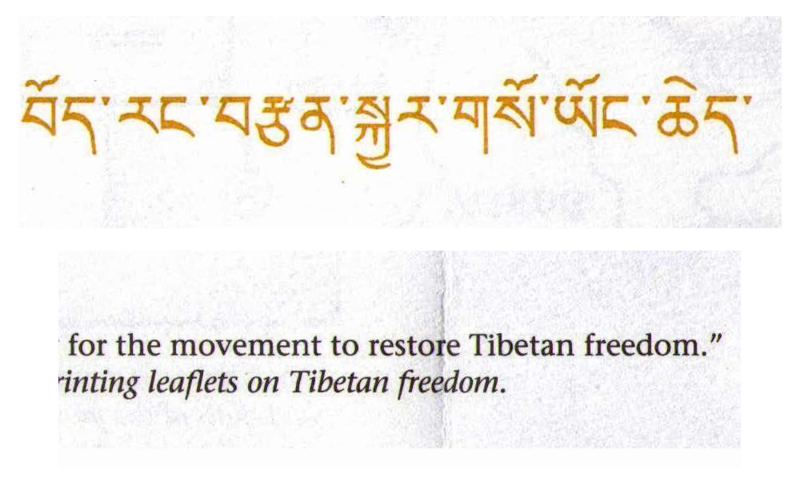 It is altered so that his call for the restoration of Tibetan independence (rang-btsan; here elegantly written as rang-brtsan), becomes a call for the restoration of Tibetan freedom (rang-dbang). For emphasis the distortion is repeated in the description just under the translated quote. Since, as your letter indicates, ICT is warming to the task of setting the record straight, allow me to help by offering a modest proposal. Perhaps ICT might start with some research into how far this particular misrepresentation has gone: how many of its posters, flyers, statements before governmental bodies, etc.—all dispensing with any Tibetan text—just flat out rendered rang-btsan as freedom over the years. I’m sure ICT must have an archive of such documents. (Anecdotally, I remember very well voicing a complaint about this issue back in the day to a [non-Tibetan] ICT employee and being told that it was a non-issue, that rang-btsan means “freedom.”) More importantly, the appointed researcher might also try to assess what, if any, damage has been done by all this: how has this particular misrepresentation contributed to the demonization of those calling for rang-btsan (a category that would have to include Ngag-dbang phul-byung—at least before ICT got hold of his words) as extremists, something that likely colors Western reports even today. And so the researcher ought also to consider how to rectify the situation. Such an undertaking would be a lot of work, I well understand. But it would be a major contribution to our understanding of one very important aspect of the rhetorical constructions around the Tibet Issue. Finally, Chris, you state that I am asserting that ICT is involved in a conspiracy. Now conspiracy can be a scary word and the desire to paint a rhetorical opponent as a conspiracy monger of some sort may be understandable on your part (it is almost Halloween, after all). But I did not use the “c” word. However, if you do insist on insinuating that I did or that I meant to, might I suggest that it’s best not to start your letter by stating that someone else (unnamed, of course!) has asked you to write it? Just a suggestion, but I hope it’s helpful. P.S. I hope this hasn’t quashed my chances for next year’s Light of Truth Award!